Rhonagolf | Golf Lessons with Rhona Law | Grande Prairie, AB | The Game Begins with You! Children learn very differently than adults. In fact, the main style of learning for young children is through play. Blending goals with challenge, imagination, and self-discovery create the basis for a child’s learning environment. Research shows that people who self-discover a concept are more apt to embrace and ‘own it’ more fully than being told what and how to execute something by another person. The learn to play, play to learn concept is very important at Rhonagolf.ca. When we teach golf we like to teach the whole game. When we teach children we like to show them how to play the game by incorporating games that resemble situations out on the golf course. Let’s not line our children up across the driving range to hit golf balls, why not assist them in self-discovery, and encourage imagination. 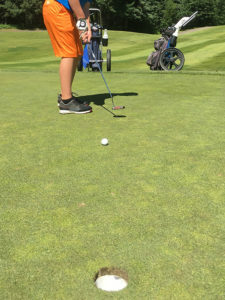 At the Rhonagolf.ca junior golf camps, our junior golfers are encouraged to be creative, to experiment and learn for themselves discovering what works best for them. 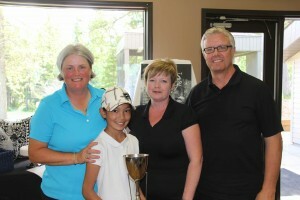 At the Rhonagolf.ca junior golf programs we help kids build a love of the game that will last a life time. Putting accounts for about 40% of your overall score, yet we spend less than 10% of our time practicing it. I drives me crazy when I go to the golf course and see the driving range full and the practice green empty. As we move closer to the golf season take some time to work on your putting game. You don’t need a large area, just a piece of carpet, your putter and a few golf balls. In putting like every other shot in golf practice a step by step routine. Whether you are playing with friends and family your routine should never vary. 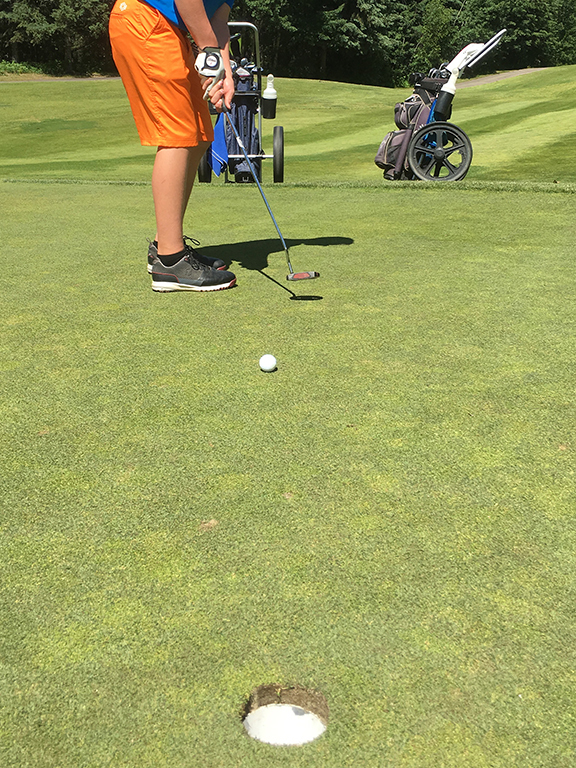 By sticking to your routine you keep your mind on the task at hand-visualizing how to stroke the putt so as it goes into the hole and avoid any negative thoughts. It also helps with setting up the same way every time, which makes for a more consistent stroke. This season commit to this: keep your eyes over the ball at address, and your head absolutely still though out the stroke. Keep your head still for 3 seconds after the ball has been struck. You don’t have to watch the ball fall into the hole, you will hear it drop. It’s a great sound. I’m looking forward to a new challenge in 2012 as the Head Professional at the Grande Prairie Golf and Country Club. Rhona Law did it again. The LPGA member and golf instructor at The Dunes Golf and Winter Club won the Grande Prairie Golf and Country Club’s Ladies Open Sunday, for a second-straight year. 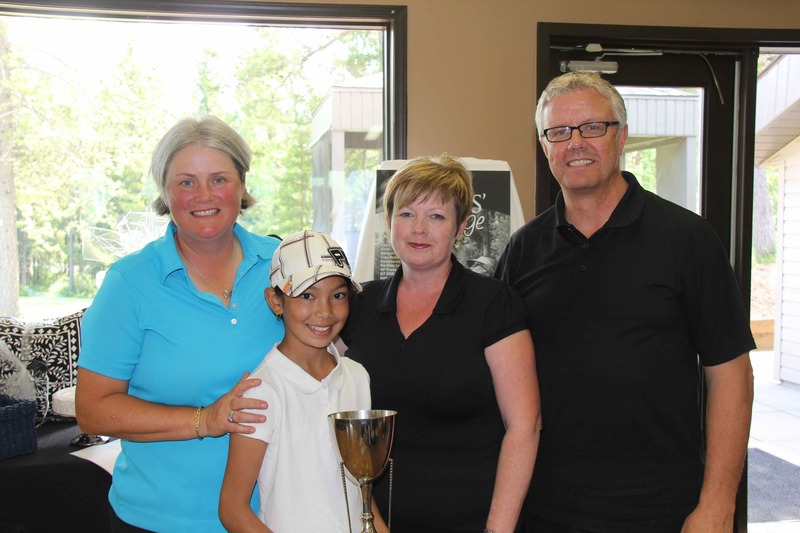 The Dunes Ladies’ Challenge was held this past weekend. My partner, junior golfer Alyshia Suleman, and I were the overall winners for this year. We played 2 different formats over this 2 day event. Saturday featured a Scotch Ball format and Sunday was Scramble. All of the proceeds from the tournament will go to the development of Junior golf. The Weekender Clinic for July 9th and 10th unfortunately has been cancelled due to the heavy rain. Anyone who has registered is welcome to join the July 30th and 31st clinic. 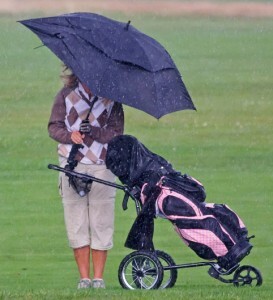 If that doesn’t work please contact Rhona at learn@rhonagolf.ca or call at 780-518-0248.